The Genius Traveler 9010LS Laser Mouse is a comfortable wireless mouse (not Bluetooth) that feels good in the hand and provides some features that make it worth checking out. 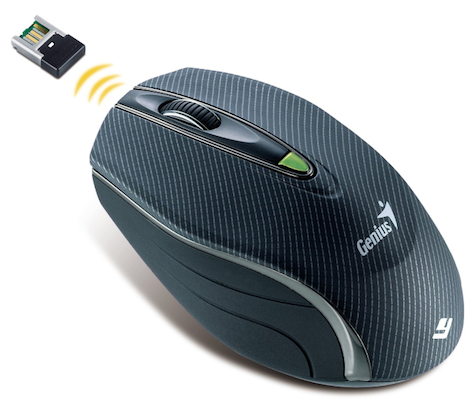 The mouse comes with a wireless receiver that you’ll plug into a USB port. The receiver didn’t work in the USB port on my Mac Pro but as soon as I plugged it into my USB hub the mouse promptly sprung to life. No setup required. The mouse comes with a single battery compartment that will accommodate either one AA or AAA battery. In all, there are three buttons and a scroll wheel. In OS X the right button is the context sensitive drop down menu. The left button does nothing on a Mac but can be programmed for a PC if you download the Genius driver. And lastly there’s there’s an On/Off Switch on the bottom to help preserve battery life. If you’re traveling with a laptop Mac and don’t want to leave the wireless receiver in a USB port, you can remove it and store it in a secure slot in the bottom of the mouse. There’s also a sticker that attached to your laptop which you can use for mounting the mouse when you’re on the road. If you’ve ever been frustrated by quirky or impossible mouse pointing on clear glass or lacquered surfaces, you’ll appreciate the DarkEye technology that completely eliminates that problem with the Genius Traveler. I tried it on several different surfaces and it was quick, responsive and accurate.